Hurll Nu-Way has now become an authorized distributor of GE Roots blowers in Australia and New Zealand. GE has recently acquired the well-known Dresser Roots blowers, the manufacturer who designed the original ‘Roots’ style blower, and announced the Dresser business’s integration into GE’s Energy Services and Power & Water business units. Hurll Nu-Way, with over 30 years of expertise in supplying, building and repairing blowers for Australian energy, manufacturing and water businesses, is proud to add GE Roots blowers to our extensive range of products in order to provide further solutions to our clients’ needs. The GE Roots range includes 2 and 3 lobe bowers, single- and multi-stage centrifugal compressors and control systems all designed for top performance and minimal maintenance. Exclusive WHISPAIRTM design of 3-lobe air and gas blowers allows equalizing pressure pulses, reducing shock wave intensity by up to 40%. It means lower energy consumption, lower noise and longer life of equipment. EASYAIR®X2 Factory Blower Package System, produced for pressure or vacuum applications, provides simple, on-site installation. 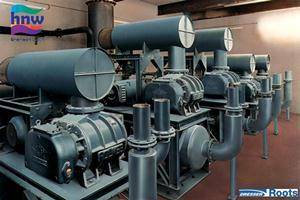 3 primary lines of Centrifugal compressors will help tailor your design solution to most efficiently handle your application. Whether it be conveying, aeration, vacuum, agitation/mixing, combustion, fogging or gas transfer, material drying or mining & mineral processes application, Hurll Nu-Way will help you choose the right blower to suit your application for any industry.